The Commonwealth was looking for a way to provide both its constituents and legislatures with a public means to access important information related to upcoming events, bills moving through the legislative process, committee membership, legislator contact and biography information, and educational materials. All of this needed to be built in accordance with the Americans with Disabilities Act (ADA). A secondary goal was to create internal workflows to support the drafting of bills and allow historical bills from the existing mainframe systems to then be searched and displayed on the public Web site. Tallan developed a system of internal workflows and the accompanying ADA compliant public Web site using a Microsoft ASP.NET MVC application layer, a SharePoint Web Content Management system, FAST Search Server, and SQL Server database backend. A significant advantage of the new public Web site is that changes and bill history records for legislative documents are instantly viewable by constituents on the public site. 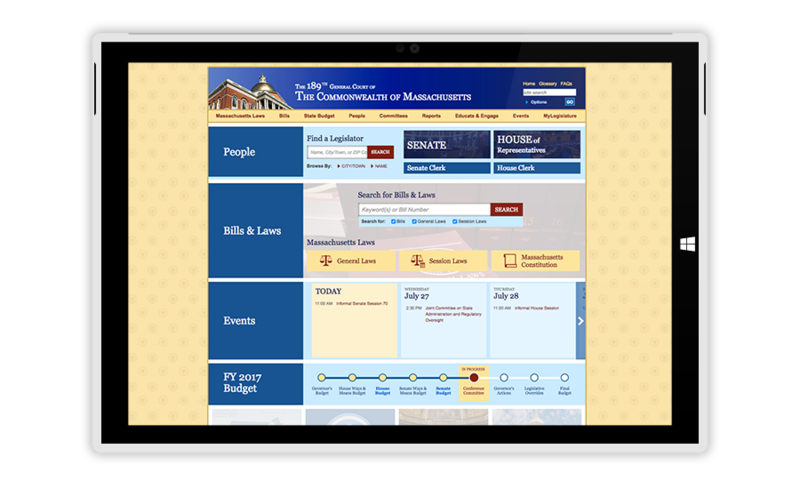 Residents can now view the text and status of a bill, captured by the Legislative Automated Workflow System (LAWS), on the public Web site as it passes through the legislative process.